In learning the japanese language, what does "negative form" mean? For example, when conjugating verbs, I somewhat get confused & I'm often corrected by others that I use the "rude form" of a verb. Right now I'm learning about godan verbs, ichidan verbs, & the irregular verbs. Can you explain to me the form or types of forms there are (like when to use this type of verb in negative form and basically to explain to me what they mean by "negative form"). It's overwhelming learning present tense, past tense, formal form, etc. are referring to the "plain-form" in Japanese. 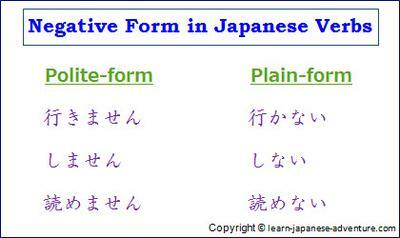 Basically, Japanese can be divided into "polite-form" and plain-form". I have explained clearly the differences between them in basic lesson 18 on Japanese verbs. In short, you use polite-form when you are talking to someone who you have met for the first time or not close enough, or to your superiors. It's considered rude if you speak in plain-form to these people...hence the name "rude-form". You use plain-form when you are talking to family members, colleagues or close friends. It will seem strange to talk to them in polite-form. Note: Godan verbs are Group 1 verbs, ichidan verbs are Group 2 verbs and irregular verbs are Group 3 verbs as explained in the lessons in this site. In conclusion, I suggest you should learn the various forms one by one in the correct order so that you won't be confused. I would suggest that you first learn the polite-form of verbs, i-adjectives, na-adjectives and nouns. After that, proceed to learn the plain-form which is more confusing in my opinion. Visit the following lessons under the "Related Pages" for further discussion on polite-form, plain-form, various types of Japanese verbs and how to form and use them, past tense of Japanese in polite-form and plain-form, etc. Japanese Verbs plus Polite and Plain Styles. Japanese Verbs - Dictionary-form and Nai-form. Past Tense in Plain Form.